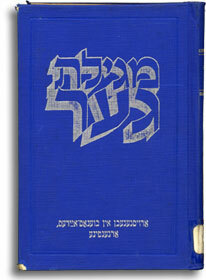 Megillat Ger, The Yizkor Book (Memorial Book) for the Jewish Community of Ger. Known as Gora Kalwaria - Calvary Hill - in Polish, Ger was a small and numerically insignificant shtetl less than 25 miles from Warsaw that has little impact on Polish consciousness today. But for Jews, Ger represents a veritable giant of Jewish tradition, one whose name marks hundreds of Hasidic Jews even today. For centuries a sleepy Polish village, Ger became a Jewish stronghold after 1795, when Prussian authorities allowed Jews to settle within the town's walls. A century later, Jews made up more than half of the town's population of 5,300. Those 100 years of growth paralleled the rise of Hasidism from a marginal subgroup to a major force in Polish and Ukrainian shtetlekh. The Gerer Hasidim went on to become a very popular and respected Hasidic branch in the world, endowing the little shtetl with a unique purpose and specialized livelihood in providing for the physical and spiritual needs of the many visiting devotees who flooded in and out of town. 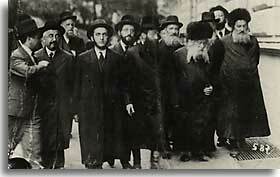 The Gerer Rebbe, Abraham Mordecai Alter (2nd from right), walking with a group of supporters. At the start of the 19th century, Hasidic expression and piety took new forms. At the center of the Hasidic movement were the tsadikim, or rebbes , the charismatic and learned rabbis who became guides and interpreters of religious texts and traditions for the mass of followers. The tsadik achieved his authority not simply through book knowledge but also through his mystical connection to God. The tsadik would sit within a "court" of sorts, usually no more than his home, to which his followers flocked to davn (pray), pay respects, seek help and guidance with personal problems, or simply to bask in his glowing wisdom. As a tsadik's following increased, so did his physical court, which could sometimes grow to contain a beys-medresh , mikve , large kitchen, and storage rooms, in addition to the familial and guest living spaces. If a Hasidic group had no "court," then the tsadik and his disciples gathered in a modest synagogue nearby. The tsadik was concerned with the quotidian side of shtetl life, the economic worries, illnesses, and the pervasive poverty of his community. His court was filled with devotees, scholars, the sick and destitute, persons in search of learning, advice, or miracles. In return for his help, pilgrims offered a pidyen (redemption), or small payment usually commensurate with the size of the favor. The vision of Hasidic life emanated from the great rabbis who led each court. In the following material we discuss the great leaders of the Gerer rabbinical line. In 1859, a great rabbi Isaac Meir Rothenberg Alter founded the Gerer dynasty, and the Gerers soon were known to be some of the brightest of Hasidic scholars. Like others the Gerers adhered to strict Jewish law, but they were also influenced by mysticism and expressed a rapturous joy for God. The Gerers wore dark Hasidic garb. Tall, round spodik hats crowned the heads of married men. Although most Hasidim today wear similar attire, there are differences in hats, socks, shoes, and coats, with are particular to each dynasty. 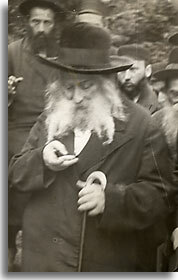 The Gerer Rebbe, Abraham Mordecai Alter (1866-1948). Reb Alter (1789-1866) was a formidable Torah scholar who succeeded his mentor, the Kotzker Rebbe Menahem Mendel. Instead of forming his court at his home in Warsaw, where he worried the young Hasidim would be distracted by the city's excitement, Alter settled it within the much more sedate environment of Ger. In addition to authoring religious texts, he also proved to be a tireless leader who fought for the Gerers' right to preserve their traditional way of life in the face of encroaching modernity. He bitterly resisted regulations imposed by Polish authorities requiring modern dress (regulations followed by the shtetl's opposing Maskilim ) and was briefly imprisoned for his stubbornness. Yet while he strove for discipline and perfection in study, he always made himself available to his followers, with whom he was deeply involved in simple, day-to-day matters. Reb Alter was succeeded by his grandson, Judah Aryeh Leib Alter, in 1870, after he had experienced the loss of all 13 of his children. The new Reb Alter (1847-1905) also was a formidable scholar but he sought to make religious texts more accessible to the masses, favoring clarity over complexity. His tenure coincided with the rising wave of Zionism building at the end of the 19th century, and he made a point to unequivocally disassociate himself from that movement. Next, in 1905, came Reb Judah Aryeh Leib Alter's eldest son, Abraham Mordecai Alter (1866-1948), who was perhaps the most influential of all Gerer tsadikim. He was nicknamed "Imrei Emet" (Speaker of Truth). Under his leadership the Gerer court reached its height of influence, gaining a reputation of excellence throughout the Hasidic world. Imrei Emet was also among the founders of Agudat Israel , a conservative anti-Zionist religious political party that stepped into the difficult and diverse political world of the 20th century, articulating their view of what the essentials needs were for Jewish survival in Poland. Though almost all of the Gerer Hasidim perished during the Holocaust, the Rebbe miraculously escaped from the Warsaw Ghetto in 1940 and managed to reestablish his court in Jerusalem. Interestingly, he then parted from many other Gerer Hasidim in his firm support of Zionism, believing the movement embodied a genuine observance of mitzvot in its fight for the Jewish people. Following the war, the original Gerer synagogue was transformed into a warehouse. If you ask a Polish citizen today, "Which way to Ger?" it is likely that no one would understand why a tourist would be interested in such an inconsequential place. The Jewish Ger no longer exists, and there are few traces remaining today to remind residents that this important Jewish community once thrived there.